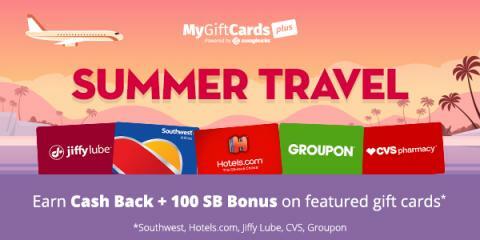 Being Frugal and Making It Work: MyGiftCardsPlus Summer Travel Promotion! Click to get started on earning your own FREE GIFT CARDS! If you're not a Swagbucks member yet, you'll be able to join first so you can get your points from your purchase on MyGiftCardsPlus and then redeem them on Swagbucks for MORE gift cards to places like Amazon, Target, Starbucks, or PayPal cash!